East-West Chanoyu Center presented tea ceremony demonstrations throughout the weekend at Sakura Con this year. This event is very popular, so I arrived early to secure a seat. Timothy Sowa Olson provided narration for the tea ceremony. 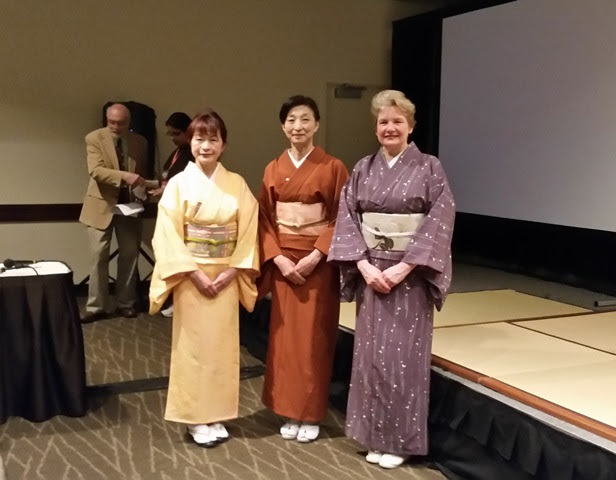 The host (Teishu) was Ko Shimizu with Bonnie Soshin Mitchell, founding director of East-West Chanoyu Center, as the main guest (Shokyaku) and Akemi Edwards as second guest (Kyaku). The scroll read "Wakei Seijaku" which are the principles of tea. "Wa" is harmony, "Kei" is respect, "Sei" is purity, and "Jaku" is tranquility. These principles may be understood as harmony through fellowship, respect through awareness, purity through sincerity, and tranquility through gratitude. The event opened with an explanation of the history and philosophy of tea ceremony which Timothy describes as waking to what is within yourself. He also shared a beautiful poem by Wu-men. We learned that tea gardens are green without the distraction of colorful flowers. Water is sprinkled over the garden to give it a fresh, dewy, and inviting appearance. The traditional teahouse is modeled after the modest huts with thatch roofs and mud walls where scholars would retire to study. The music of the tearoom is in the gliding steps on tatami, water heating in the kettle, and the pouring of water. Some long-time practitioners can distinguish between the sounds of hot and cold water being poured into the kettle. There are two seasons in tea ceremony, warm months (summer) when the kettle is heated over a furo (brasier) and cold months (winter) when the kettle is heated in a ro (sunken hearth). Shapes, patterns, imagery, and texture within the tea room indicate the season, alongside the floral display and incense. Each chawan (tea bowl) is unique and selected for the feeling of the moment. The chawan for this demonstration featured a camellia and the sweet was Cherry Blossom Haze, having the appearance of cherry blossoms viewed through the morning mist. There are over one hundred temae (forms) studied in Urasenke. How the fukusa (silk cloth) is folded is specific to the tea school. Titles for tea ceremony practitioners are made up partially from the name of your teacher and partially something of yourself, so Timothy's title is "So" from the family name of the Urasenke Grandmaster and "Wa" for harmony. Following the demonstration, tea and sweets were served to the audience. The matcha used in the tea ceremony was Jyoraku from My Green Tea. If you're interested in learning more about tea ceremony in Seattle, tea rooms include East-West Chanoyu Center in Hawthorne Hills, Shoseian in the Seattle Japanese Garden, and Ryokusuian, a 3-mat teahouse in the Seattle Art Museum.